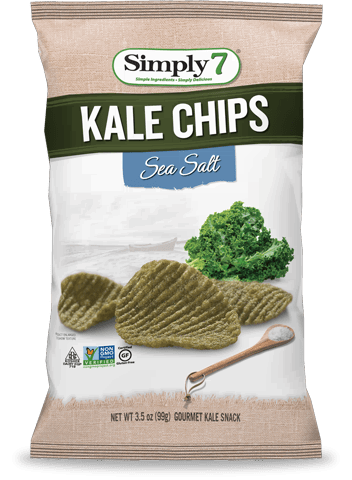 How do you make a chip out of kale? We turn real kale and real potatoes into a flour and then form those flours into a tasty, ridged chip. We then cook the chip and season it with the all-natural, simply delicious flavors you love! Our Hummus Chips aren’t technically made out of hummus, they are made out of chickpeas, the main ingredient in hummus. We take chickpea flour, apply a lot of pressure and heat to turn it into that dippable shape you are eating, then bake it to seal the nutrients into a raw-pasta-like shell. Then we quickly fry the shell to get the satisfying crunchy texture and add a special blend of seasonings to bring out that great hummus taste. 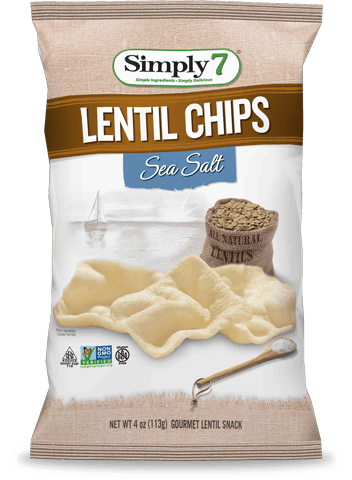 How do you make a chip out of Lentils? We turn real lentils into a flour and then apply a lot of pressure and heat to turn it into a light, puffed chip. We then cook the chip and season it with the all-natural, simply delicious flavors you love! How do you make a chip out of Organic Veggies? We take your favorite organic veggies - spinach, potatoes and tomatoes - and turn them into a flour and then form those flours into a rigged, crunchy snack. We then cook the chip and season it with all-natural, USDA organic spices! How do you make quinoa curls? 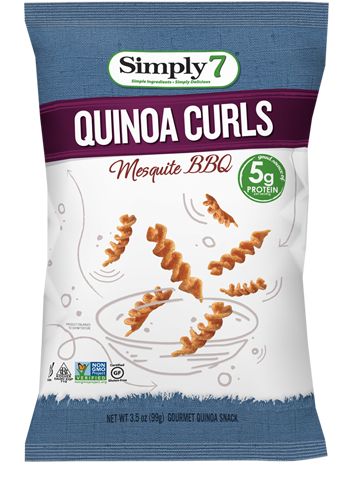 We grind raw quinoa into quinoa flour and then form it with pea protein into this fun, crunchy, twisty snack. We then cook the chip, season it with your favorite flavors - original with just a pinch of sea salt, farmhouse cheddar and mesquite BBQ - and send it out for your family to enjoy! We are involved in every aspect of the process from farm to shelf. We work closely with our suppliers to get all-natural ingredients that are non-GMO and live up to our standards of quality and taste. We spent months developing each unique flavor, tasting different versions and making adjustments. And the bag design was very much a labor-of-love in bringing the story of Simply7 to the shelf (we had a good bit of help from our design company too). How do you make the popcorn? We take blue and/or red butterfly popcorn and air pop it, making it relatively lower in fat, and season it with your favorite flavors. Where can I buy Simply7 snacks? Our team is always hard at work getting our snacks into a store near you. Use our store locator to find out where we are now. If we aren’t near you, you can buy our snacks on Amazon, or let us know if your favorite store doesn’t have our snacks yet by contacting us. What does “clean ingredients” mean? Clean ingredients is one of our 7 Simple Standards, because we are committed to producing better-for-you snacks made with non-GMO ingredients. There are 0 grams of trans fat in our snacks (another one of our 7 core standards). There are also 0 grams of saturated fat in our Lentil chips and only 0.5 grams of saturated fat in our Hummus Chips, Kale Chips, Quinoa Chips, Organic Veggie Chips, Quinoa Curls, and our Simply7 with Giada Popcorn has 1-3 grams of saturated fat. All of our snacks are made using all-natural sunflower and/or safflower oil. Our Simply7 with Giada Sea Salt & Olive Oil flavor is made with extra virgin olive oil. What kind of protein is in your Quinoa Curls? Our chips are made to be dipped! We worked hard to make sure that each flavor tastes great on its own, but eating them with dip truly makes these snacks taste exceptional. Check out our recipes and mix-and-match to find the combination you like best. Simply 7 Snacks are made without artificial preservatives, and they still stay fresh for 8 months (or more). 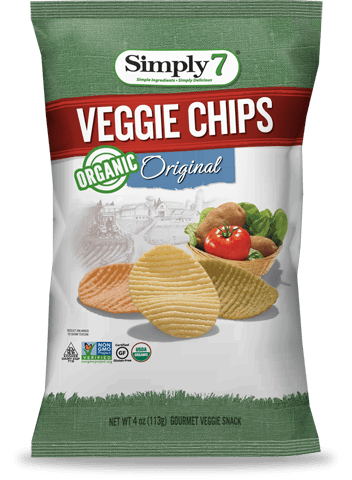 Our new Organic Veggie chips stay fresh for 9 months. 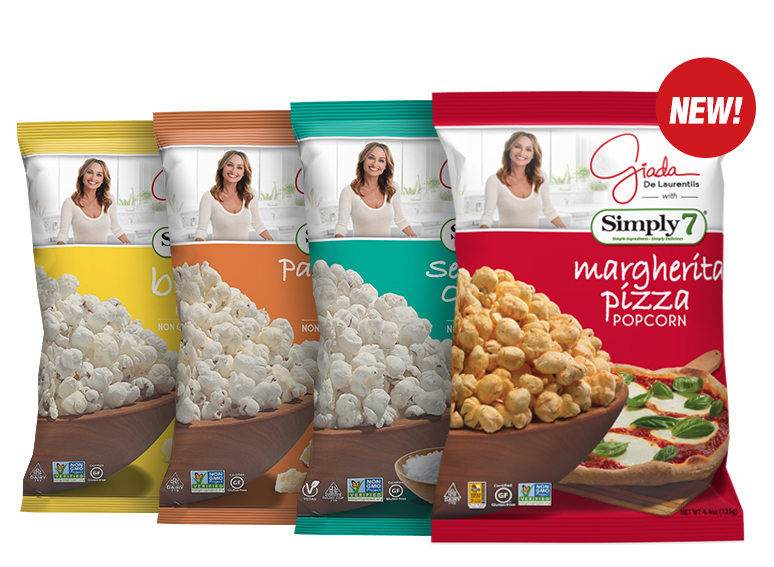 Our Simply7 with Giada Popcorn line has a shelf life of 6 months. If you can’t finish the bag before it goes bad, we are doing something wrong! Yes, all of our snacks are Kosher certified by the CRC – Chicago. Are there any nuts in your products or facility? All of our products and our facility are peanut and tree nut free. 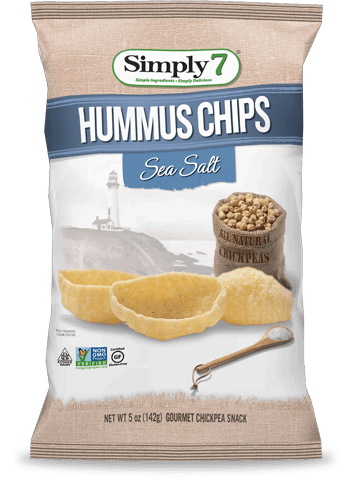 Are Simpy7 Snacks Certified Gluten Free? Yes, all of our snacks are Certified Gluten Free. All of our chips are Gluten-Free Certified. Simply 7 Snacks are made in Houston, Texas, located close to a port to easily get our authentic ingredients from around the world and perfectly positioned to quickly send our chips all over the USA. It’s not just our story, it’s your story too. Get a few bags of Simply7, share some with your closest friends, and then tell the world about your experience. You can become a fan of ours on Facebook, follow us on Twitter, or check us out on Instagram. Our products are initially baked to cook them, and then flash-fried for a couple of seconds for texture. Most of the cooking is done through baking. In addition, our raw ingredients don’t absorb as much oil as potato chips, which is why they are lower in fat. Are your products made in a facility that uses dairy? Yes, they are manufactured in a facility where dairy products are present. We adhere to strict processes to minimize any cross contamination; however, there may be trace amounts. Why did you partner with Giada? We wanted to introduce a popcorn that focused on the uniqueness of the main ingredient with authentic flavors. Award-winning chef Giada De Laurentiis was also looking for a snack she felt good about giving her daughter, Jade (a popcorn fan), but didn’t like the options on shelves. Together, we mixed her Italian heritage with simple ingredients to deliver chef-inspired real flavor in a snack that’s parent and kid approved. What is Fund Her Farm? What are you doing with the Fund Her Farm Organizations? Right now, we’re working with Annie’s Project and the Women, Food & Agriculture Network – both organizations who are dedicated to making a lasting impact for women in the agriculture industry and supporting them in all areas. Each organization is receiving donations to support programs to forward their missions of educating and providing resources to female farmers. The Women, Food & Agriculture Network is a community of women in sustainable agriculture working to engage women in building an ecological and just food and agriculture system through individual and community power. Annie’s Project is a 501(c)(3) nonprofit organization dedicated to providing educational programs designed to strengthen women’s roles in the modern farm enterprise. Didn't find the answer you were looking for? Simply send us a message.